Channel 4 has denied reports that ad breaks for The Great British Bake Off will be a record length, as one of the show's presenters advised viewers to record the show and fast-forward through the ads. The baking contest show, which makes its debut on 29 August after Channel 4 bought it from the BBC last year, will have four breaks lasting a total of 16 minutes and 42 seconds. This will include ads as well as Channel 4's own promos, which are not counted by Ofcom as advertising. 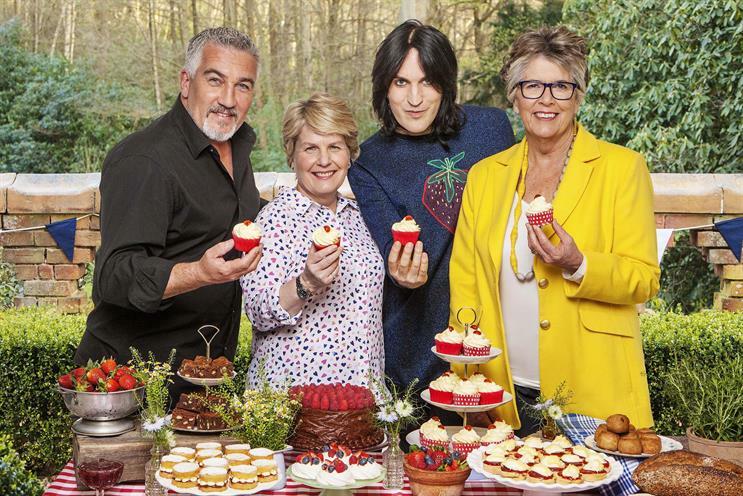 Prue Leith, the new Bake Off judge who has replaced Mary Berry to star opposite familiar face Paul Hollywood, advised fans to record the show so they could fast-forward through the ad breaks, the Telegraph reported. Meanwhile, a Channel 4 source was reported by The Sun as saying that no other show on the channel had this many ads for a programme that is 75 minutes long. However, a Channel 4 spokeswoman told Campaign the number of ads in Bake Off would not be a record and said the "exact same ad pattern" was used during an episode of The Handmaid’s Tale in May. In an advance screening and question-and-answer session with journalists yesterday, chief creative officer Jay Hunt said she made no apology for the show having ads and insisted the broadcaster had been careful in considering where the ad breaks sit. The Ofcom code on the scheduling of television advertising sets a limit of 12 minutes for ad breaks on any channel, while public service channels like Channel 4 must not show ad breaks longer than an average of eight minutes per hour between 6pm and 11pm. Each individual ad break on Channel 4, meanwhile, is not allowed to be longer than three minutes and 50 seconds. Hollywood is the only member of the original show to follow Bake Off from the BBC to Channel 4. Noel Fielding and Sandi Toksvig have replaced Mel Giedroyc and Sue Perkins as the show’s presenters. The Channel 4 spokeswoman added: "As the programme format remains unchanged, Bake Off episodes are 75 minutes long to ensure that viewers can enjoy all of the competition action they love. Channel 4 is a commercially funded, public service broadcaster which puts its profits into programmes. Advertising allows us to invest in high quality British productions like the Great British Bake Off and keep them free to air for viewers. "A 75-minute slot is not usual in the Channel 4 schedule so there isn't a standard programme run time, however, the Bake Off run time (58 mins) across the 75 minute slot is consistent with the run time of programmes on other free-to-air commercial public service broadcaster's channels in similar peak time slots." WCRS chief strategy officer Matt Willifer said most Bake Off viewers were unlikely to take Leith's advice. Willifer told Campaign: "People are free to follow Prue’s advice, but the data suggest not many of them are. 60% of video consumption in the UK is live TV, as opposed to 11% playback TV and 4% broadcaster VOD. I imagine the percentage watching live is even higher for the Bake Off audience, and for particularly popular programmes like Bake Off which people want to see at the earliest opportunity." Mark Jackson, managing director at MC&C, said Bake Off fans were likely to watch live because they were afraid of "spoilers" and cited the appeal of Game of Thrones on Sky Atlantic as a show that people wanted to watch live. "The best way to avoid spoilers? Watch live. Plus, with hashtags and trending topics dominating Twitter feeds, many will be forced to engage with the programme as it plays out in real time," Jackson added.